Turns out, the story was all true. Pamela Kovach, a Youngstown-area doctor, wanted to honor her deceased husband, John Kovach, Jr., by making a sequel to his gangster film, Youngstown Shakedown. Megalis and his partner, Jon Kasunic, headed to Youngstown to meet the doctor and find out more. 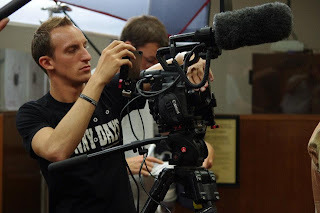 After learning more about Kovach, his filmmaking dream, and his widow’s hope to carry on that dream in some fashion, Megalis and Kasunic decided they were up to the challenge. And challenge it was, because the film (and its financing) came with some rules. Megalis and Kasunic say it was like Eurystheus ordering Hercules to perform the 10 labors. Megalis and Kusanic wrote the film. Kusnic produced and Megalis directed. 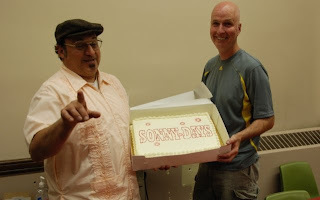 Sonny Days stars Ed Bassmaster, Toby Radloff and David Early. MMM: What’s Sonny Days about? 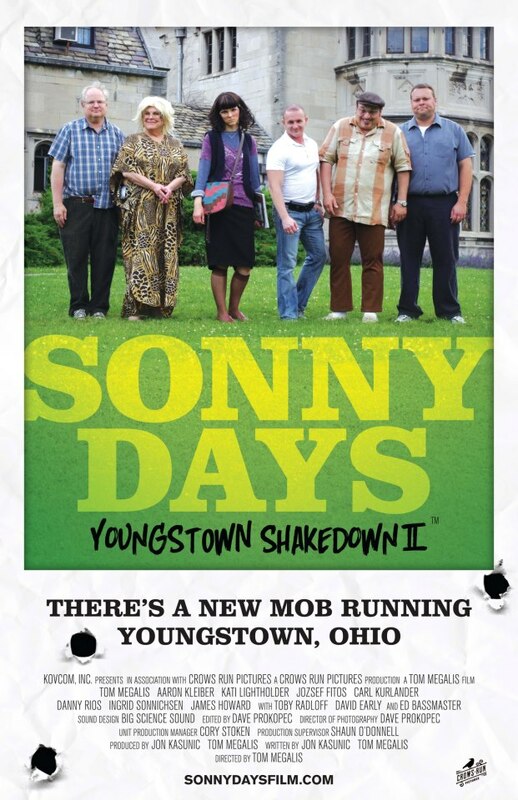 Tom Megalis (TM): Sonny Days, Youngstown Shakedown II, is an offbeat comedy about a bumbling city council on a mission to revitalize the once great steel town of Youngstown, Ohio. Desperate for funds, they resort to soliciting money from the widow of mobster Sonny "the Sponge" Sopella. One absurd scenario leads to another and frustration mounts as the group attempts to balance the council's need for cash with the mayor's desire to improve the city's image. MMM: Why are moviegoers going to love it? TM: Sonny Days is a character-driven film with a small story. It’s just strange and funny, and I think in today’s world of big blow up and high-concept, crazy reality drama, that stands out a bit. Kasunic and I just hope an audience finds it. Because if they give it a chance, they will like it. It’s kind of like watching your uncle and odd neighbors trying to solve a problem that is WAY, WAY over their heads. MMM: When did the filmmaking bug bite you? TM: I got into film my freshman year at Carnegie-Mellon University in Pittsburgh. I was there to study art and design, but found myself spending more time messing with the Super 8 cameras. It became an obsession. Actually more like an addiction. And the addiction got worse when I met Night of The Living Dead’s Bill Hinzman at a camera store in Pittsburgh. He said, “Stop with the Super 8 kid, time to get serious,” and he gave me a stack of 16mm video news film. After that day I was selling my stereo equipment to buy and process my film. After that, I went on to make films at Pittsburgh Filmmakers for years. That’s really what kept me in Pittsburgh for so long. I had access to 16mm Arri film cameras, flat bed editors and sound equipment for, like, next to nothing. It was a great place to learn to make films. During that time I got a job in advertising and met an equally demented individual, Kasunic. We clicked right away and together made a bunch of short films and even strung them into a few show ideas. They were rejected by most and all networks at the time, even cable. But we continued to work together on shorts and TV spots. At one point along the journey, I got frustrated with trying to find actors who would show up for no money, so I began to make stop motion puppet films. I won awards like the NEA, Heinz Endowment , and was in festivals like Sundance, Hiroshima, Annecy and many others. This exposure got me work directing TV commercials, probably hundreds and some work on network TV shows like Nickelodeon’s Amanda Show, Kablam and MTV’s Cartoon Sushi. It’s been a lot of fun with lots of twisted roads. Roads that still continue to twist. MMM: What kind of films do you like to make? TM: The films I like to make are “unbalanced films.” Films that you just think are going to fall apart at any second. They aren’t tidy or slick or too planned. I like script writing, but don’t love scripts. Just like I hate to pre-draw anything before I paint it. There are drawings and there are paintings. I like to be surprised by mistakes and work them into the final piece. The whole idea of three-act films doesn’t interest me that much. It’s too tidy. Just as painting is a process, a journey, a battle, so is film and that’s what I love about it. You really can’t win in film. It is impossible and failure is at every turn. But that’s what makes it great. The fight! MMM: What’s it like shooting in the Midwest? TM: I love shooting in Pittsburgh, Cleveland and the Midwest in general. The locations are real. Sometimes they are all beat-up and have great character. And for comedy, nothing is funnier than a beat-up background behind somebody ranting on about being optimistic and having dreams. Seriously have you ever laughed at a beach or a palm tree in front of a swanky Beverly Hills office building? You need contrast in comedy, and locations become a vital texture. Location scouting in the old mill towns is exciting and fun. What you put behind a character is just as important as the words that spew from their mouths. MMM: Where did you shoot in Pennsylvania? And how was that Midwest cast and crew? TM: We shot entirely in Pittsburgh, actually mostly on two streets. Amazingly we got so many looks from just those few streets. And the neighbors were fantastic. My partner Jon Kasunic’s production office is on Gist Street in the Uptown area of Pittsburgh. Jon, is super friendly and knows everybody there. And if we needed an actor, Jon would walk out and find as many people as we needed. It was amazing. I could live on Gist Street. It’s like a no BS, real street, full of hard workers, artists and just terrific human beings. The crews in Pittsburgh are top notch, friendly and just great people to hang out with. I consider many of them my friends. There have been so many Hollywood features in town and that has developed the film crew base. One of our good friends Danny Doyle owns Light Speed Lighting. His stuff is always out on Hollywood shoots that are in town. Danny really helped us out with lighting equipment. MMM: Where and when can we see Sonny Days? 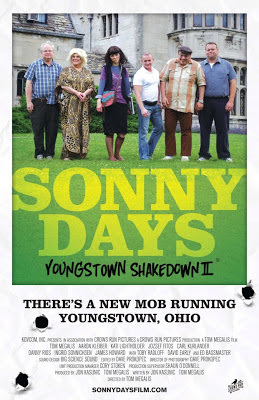 TM: Sonny Days, Youngstown Shakedown 2 will be at the New Hope Film Festival in Now Hope and Doylestown, Pa., July 12 to 21. MMM: What advice would you give an aspiring filmmaker from and living in the Midwest? TM: Make the films you want to make and have passion for, because making films is a difficult, time consuming, risky, expensive art-making process. So you better really believe and love what you are doing. Also, look at some older films that were done by artists like Scorsese, Fellini, Herzog. Work on ideas more than how to make a cool image. That’s easy to do. Dig deep and be truthful to you. Find stories that mean something to you. And remember you can’t do Hollywood better than Hollywood, not even close. But you can do you, better than they can do you. Sounds weird, but you know what I mean. I hope filmmakers continue to make films from the Midwest and don’t immediately flee to L.A. right after graduation. Or better yet, go there, get money and come back and shoot your films in the Midwest. Have your Hollywood cake and eat it too. Kind of. You know what I mean. TM: I would love to see more Midwest stories put on film. Stories that come out of the people’s experience. We have a great texture in the Midwest that is slowly being eroded by American blandness. More strip malls and chain eating joints. The Midwest is a great place to start making your stories, your films. You can live cheaply in the Midwest, get cool locations, and ask your friends and family to be extras.